The Norwegian Booktown is located in Mundal, which is the center of Fjærland. Founded in 1995, the site consists of various second-hand bookshops that extend for more than two miles. These amazing storefronts are particularly unique as they occupy former n barns, boat houses, and other historical structures. 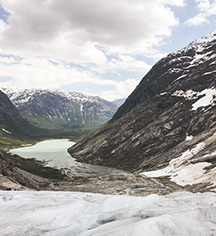 The Norwegian Glacier Museum is renowned throughout Norway for its expertise on glaciers and the environment. Open seasonally, this stunning museum features many exciting exhibits, including a panoramic film of the ancient Jostedalsbreen Glacier. Once home of the Norwegian artist Nikolai Astrup, the Astruptunet Museum is a thrilling contemporary art institution that pays homage his artwork. This fantastic museum features an extensive selection of paintings that Astrup created while living at the building during the early 20th century. 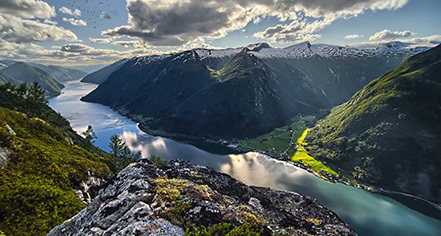 Some of his artwork includes depictions of several local landmarks in the area, such as Jølstravatnet at Sandal in Jølster in Sogn og Fjordane. During the Middle Ages, many architects throughout Norway constructed stone cathedrals that were inspired by Viking ingenuity. Using methods derived from their ancestors’ construction of seafaring boats, this generation of Norwegian’s raised countless churches that featured unique wooden staves. The nearby Kaupanger Stave Church is the largest of these historic churches in Sogn og Fjordane county still standing today. Nestled within the nearby community of Luster, the Urnes Stave Church is another historical structure featuring the unique Norwegian wooden-stave architecture. Raised during the 12th century, the building now listed as a UNECO World Heritage Site.